and some examples of recycled "rubbish"
Note the cosies I've made for the tea/coffee pot & the hot-pots in which I store water as it comes to the boil. The vacuum flasks are insulated with discarded 3kg. coffee bags I found sticking out of a rubbish bin. which came from the hard rubbish, discarded trays replacing the missing glass shelving. The heat guards were once the sides of an old gas stove. of a broken chair, that had been left on the street, to the lid, & covered it with a scarf. or acts as a pre-heater, by being in contact with the side of the stove. The pure wool rug I found in the hard rubbish collection long ago, & the wood basket more recently. The WW2 firebucket is filled with earth, while the basket on top contains a bag of bicarb.soda, which, if required, will quickly extinguish a chimney fire. 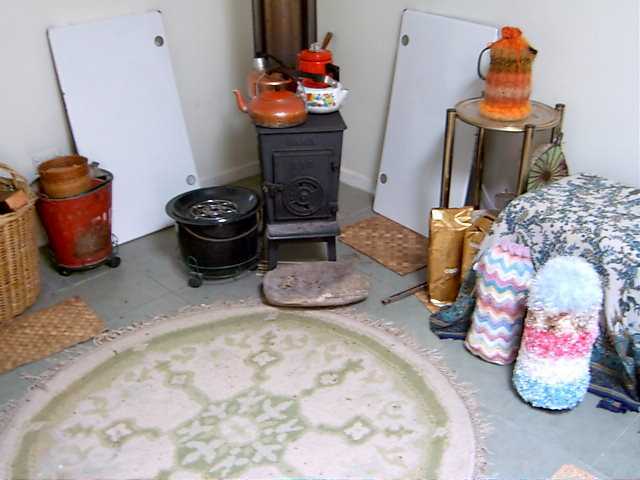 A home-made fireblanket - an old pure wool blanket soaked in a strong solution of alum, then dried, is out of sight on the left. The palm leaf mats protect the floor & the bases of empty saucepans & kettles from warping as they might do if placed straight on the cold tiles. Old barbecue tongs place wood on the fire, handle hot coals & double as a poker. Wood ash is used to sweeten the compost, & the acid soil under thick leaf mould. It can also be sifted to use as a cleaner, & leached to make potash lye.